I loved my second Christmas in New York so I couldn’t wait to post a few of my favorite pictures from the holiday season. So when Amber chose this topic for FMM, I put this post back on the front page. The holidays are such a great time, and this year was one of my favorite Christmases so far. Having Dad here made me feel at home, and I got to enjoy some pretty cool things with him. Boyfriend got to enjoy some one-on-one time with him too when he took Dad to the Giants game. And we spent a lot of time with his family during the week as well. I love being a tourist in my own city, and this year I had a great excuse because Dad was here for Christmas. 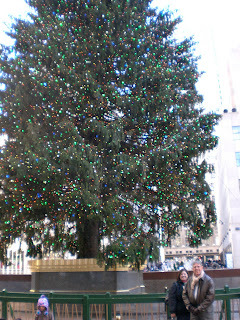 We saw the tree at Rockefeller Center and many other cool sights. Isn’t this tree huge?! It doesn’t look quite so big when you stand on the other side of the plaza, but it’s still beautiful. Christmas music plays as people ice skate which really sums up Christmas in NY, at least in my opinion. We also brought Dad to the Rockettes perform at Radio City, and it was just as awesome as it was last year. My boyfriend gave me the bracelet and the tree, and Dad gave me the heart. I treated myself to the clock last night because I want it to represent the time and patience I must have in order to continue losing weight. Plus, I just like to buy pretty things. As you can see I racked up on the gifts, but I also received tons of love and fun and got to share some too. It was a lovely holiday, and I am looking forward to what the new year will bring. What did you do the celebrate? Did you get any awesome gifts? If so, will you tell me about them? For more holiday pics of my beautiful friends and me, chick here. Wow, what awesome gifts!! I also got some fabulous things this year. One of my favorites is the BodyBugg (a la Biggest Loser) I've been wanting a long time. It's already taught me a lot!! I also received a panini press (yum!) which we have all been enjoying. I'm psyched that it also grills chicken breasts and eggplant and other vegies. YAY. (whispering now) Don't tell anyone Santa also brought us an ice cream maker. Is this inappropriate? I don't think so. The ice cream (and sorbet!) we are making is so much healthier and it is so rich and yummy I can truly be happy with just one or two spoonfuls. 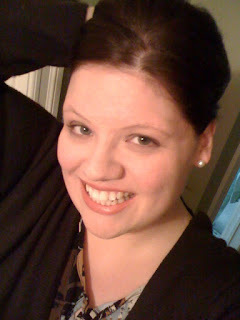 Also got some very pretty earrings (not pearls, but mother-of-pearl! LOL), socks (YAY), and some fuzzy new fleece PJs. It sounds like you had a great Christmas Kenz!! Happy New Year!! Wowee, it looks like you got some really cool gifts! I am so jealous that you saw the Rockettes! One of my all time favorite things to do in New York at Christmas time. 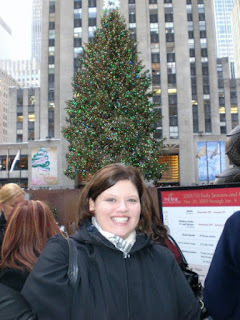 The tree at Rockefeller Center came from my home town in CT! Funny about the tree at Rockefeller Centre, I've seen the same picture this weekend made by my brother in law who has been in NY beginning of the month. 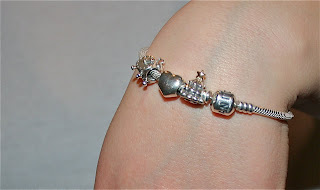 I love Pandora, I have one too, in fact I have the heart in the middle too. I didn't buy any bracelet myself but asked them from my hub, family and friends for my 40th birthday. It's now filled for 75% but I have to have special occasions before I buy a new one for myself. Great pics. I love being a tourist in my own city too! Great Pictures. Love the bracelet, and your dog is a cutie too. I've never been to New York. Thanks for sharing, and for visiting.